A major step in Triumph’s Moto2 2019 season race engine development programme came last week with the second track test at the Ciudad del Motor de Aragón. Following on from the extensive factory test programme, Julian Simon, 2009 125cc World Champion, Moto2 runner-up and experienced Moto2 test rider, put the Triumph engine development prototype through its paces. 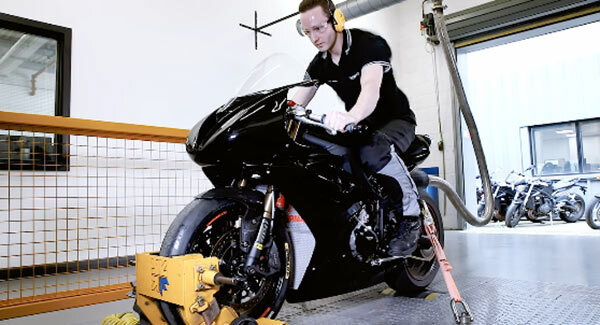 Coming mid-way through the engine development programme, this successful track shake down test provided essential data input into the performance and durability evaluation programme. Initial feedback from the test shows that the development programme is progressing positively and that we are well on schedule for the handover in June 2018 of the first batch of Moto2 race engines. This development programme is crucial to delivery of an outstanding product. We are happy with the rate of progress and look forward to racing towards our next milestone. At this stage of the development programme we are in a good place. We are very pleased with the pace that Julian is showing with the latest engine and his feedback has been very positive. We have confidence that we will deliver an engine that the teams will enjoy racing with and a spectacle and sound that will excite the fans. I am really happy to be here in Aragón testing the development of the 2019 Moto2 engines with Triumph. I can see there has been a big improvement with the latest engine, giving a great feeling. There’s a lot of power and the gearing is fantastic, and for the sound, this is also fantastic. To me, it’s fun. This testing update follows on from the announcement of Triumph Motorcycles as the exclusive engine supplier to the FIM Moto2TM World Championship from the 2019 season onwards. 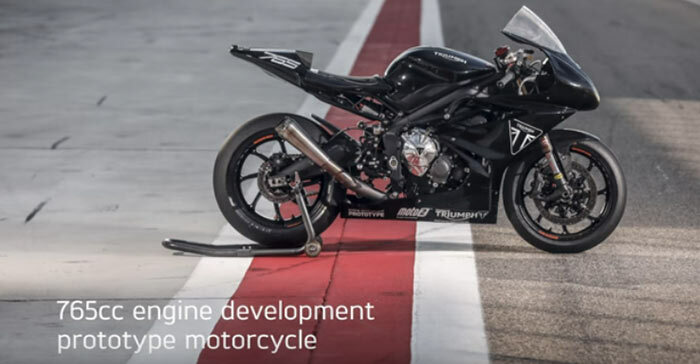 With a three-year contract with Dorna – the commercial rights holder of MotoGPTM – Triumph are to supply a dedicated race tuned 765cc Triumph triple engine, based on the powerplant from the all-new 2017 Triumph Street Triple. The new engine is a significant development of the race-winning Daytona 675R powerplant that has powered supersports wins at the Isle of Man TT, Daytona 200 and British Supersports Championships in 2014 and 2015. Based on the new 2017 Street Triple powerplant, the Triumph Moto2765cc triple engine has been developed and tuned for a major step up in power and torque. In ‘road’ set-up the new 765cc engine delivers the highest ever level of performance for a Street Triple; delivering power of 123PS @ 11,700rpm and 77Nm Torque @ 10,800rpm. The race specification Triumph 765cc Moto2TM engine has been developed further to allow the engine to breathe more freely and rev harder than the production bike; increasing overall performance. Other changes have been made specifically to adapt the engine for race use.